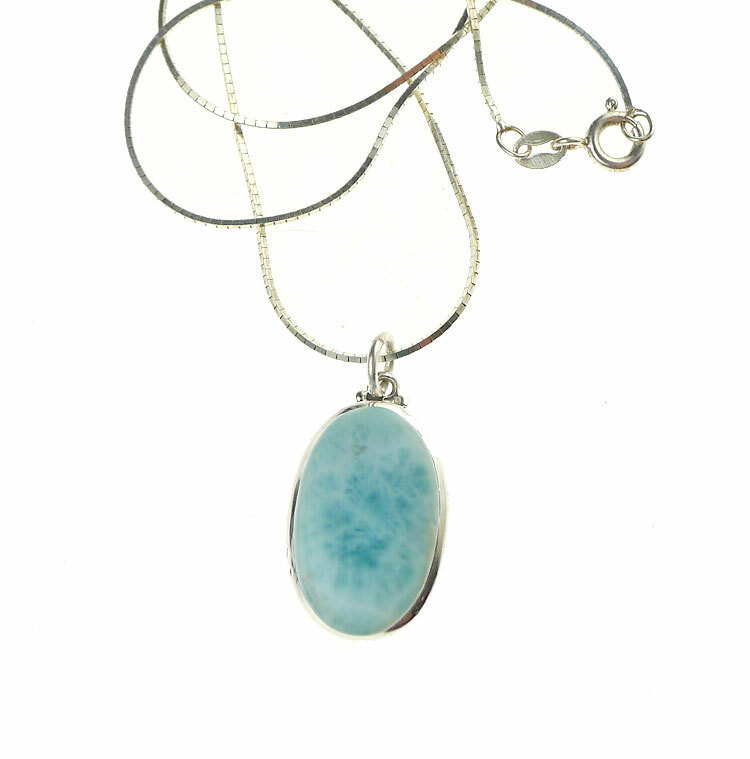 Long Oval Larimar Pendant in Solid Sterling Silver - A hand-crafted beautiful, natural high-quality oval-shaped Larimar Gemstone Cabochon bezel-set into a minimalist.925 Sterling Silver surround -- This design has a couple of little ball accents at top -- Lovely Necklace for those who wish to get in touch with the Divine Feminine or the soothing energies of Sea and Sky... 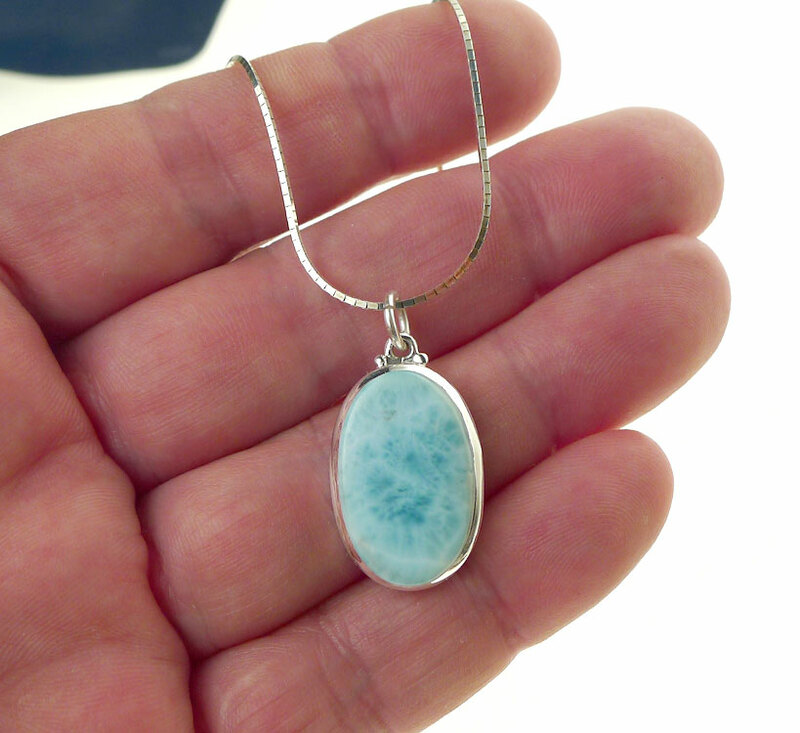 This sky-blue gemstone is found in only in the Dominican Republic in the Caribbean Sea. 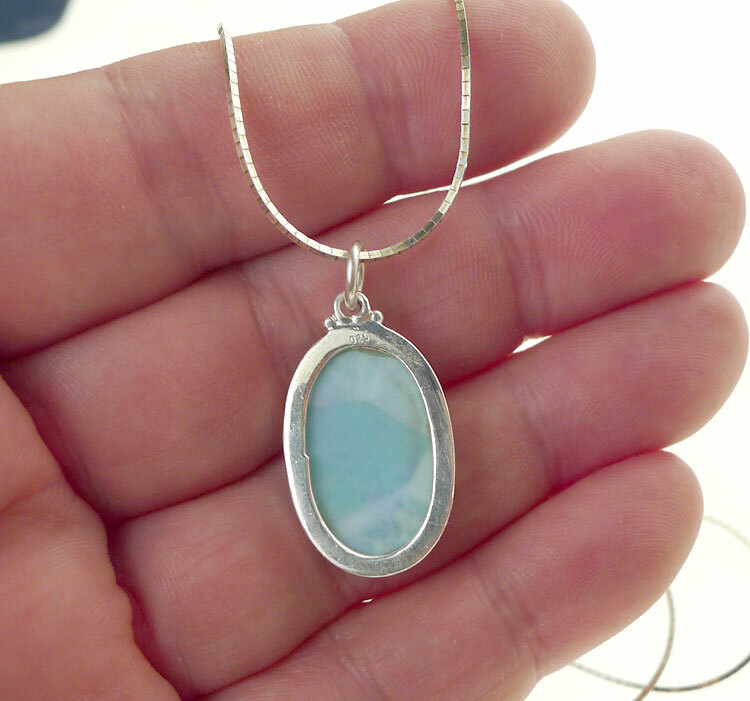 You'll receive the EXACT Hand-Made, OOAK Oval Larimar Pendant pictured. Please note, the attached jump-ring adds an additional approximate 4mm to overall length. Metal : Solid .925 Sterling Silver - Setting is .925 Hallmarked - chain is as well. 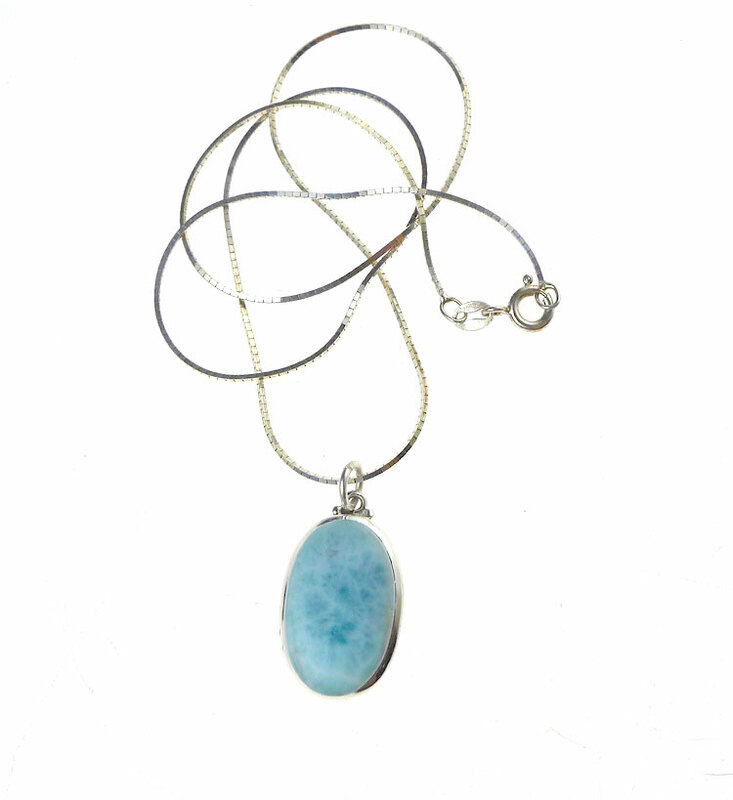 Sold by : Pendant or Necklace -- on your Choice of 16" or 18" SS Chain. 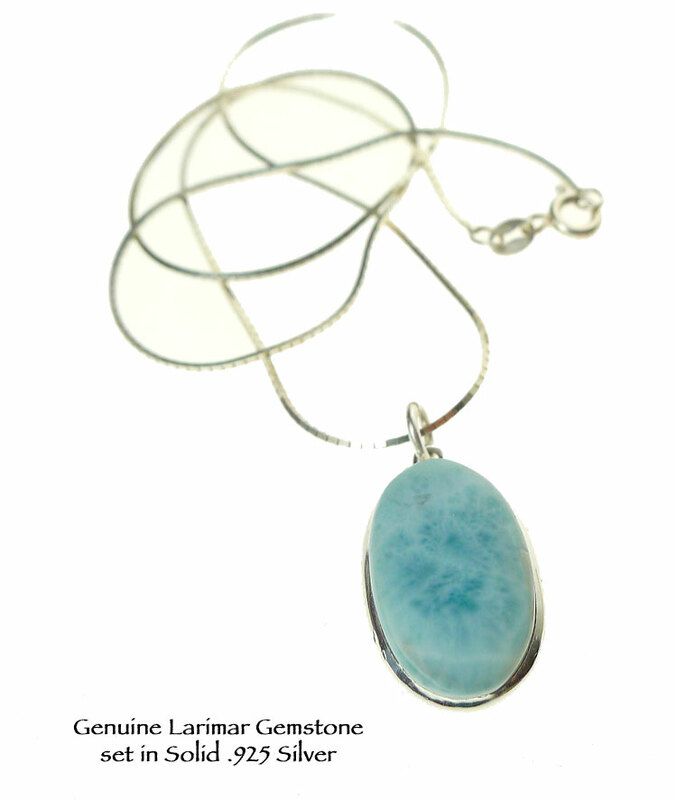 LARIMAR - Found in the Dominican Republic, Larimar is also called "Stefilia's Stone" - As an embodiment of the tranquil Sea and Sky, metaphysically Larimar is used as a healer on physical, emotional, mental AND spiritual levels. 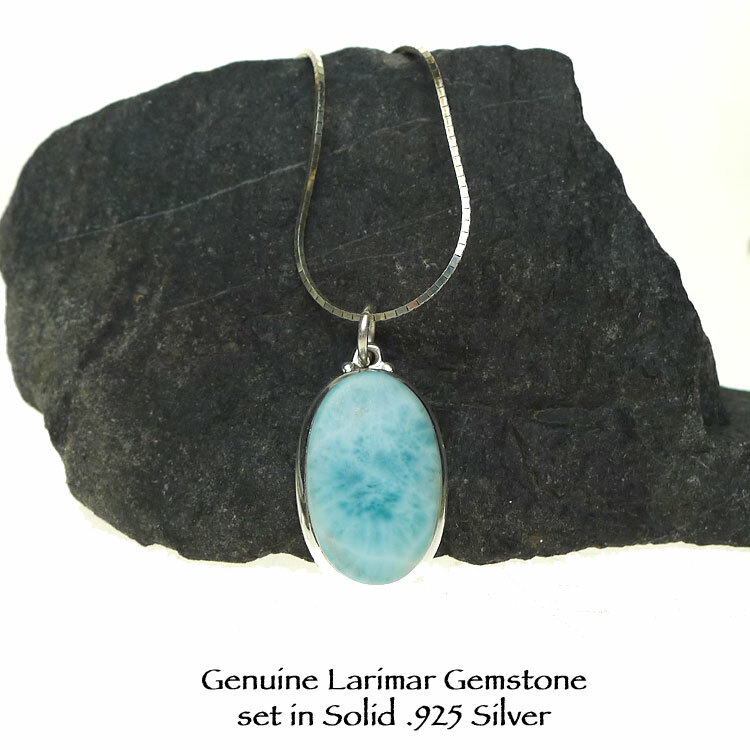 Larimar is often used to help dissolve emotional barriers and release stored negative emotions such as anger, pent-up emotional pain and other detrimental emotions that are not beneficial. 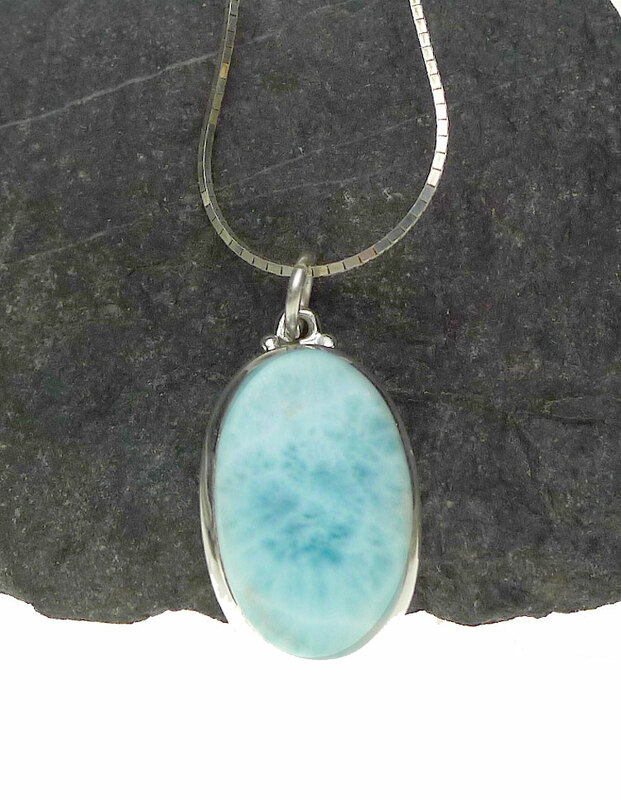 Pendant is made with Genuine Gemstone Larimar and Solid Sterling Silver. Real Sterling NEVER contains nickel or lead. Our charms, pendants, earrings and findings listed as Sterling Silver in this shoppe are NOT silver plated or silver filled; they are NOT silver plated, or 'silver colored', 'antique silver' or sterling silver plated. All Products © SILVER ENCHANTMENTS™ LLC - 1991-PRESENT -- No part of our content, designs, images, product trade name(s), trade product design(s) and product(s) can be used without prior express written permission. Reproduction Rights are Not Granted with any purchase. All Rights Reserved.